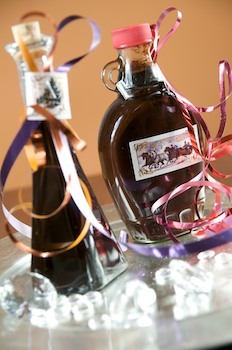 We have the “Pièce de résistance” or “creme de la creme” or Chocolate Balsamic Vinegar for you. Yes, a very special gift for you to make for your very best friends. We bought some of the “expensive stuff” as a tester and have a few recipes to give you to choose from, with some ideas to give your friends how to use this special gift. There are many different “grades” of balsamic vinegar. The less expensive are more vinegary in flavor, and thinner in texture but can be boiled down to be as good as the expensive kind. The expensive kind costs more, is sweeter and has a milder vinegar flavor. We have various recipes to offer you, so you can choose what suits you best. Frst, let us prepare the Chocolate syrup, which we will need later for the Chocolate Vinegar. Put the water in a small sauce pan. Add the sugar and salt and bring the mixture to a boil, be sure to stir well to dissolve the sugar. Add the cocoa and continue stirring. Cook only until the mixture begins to thicken, then remove from the heat. Add the vanilla and cinnamon and mix it evenly into the syrup. Some people also add a bit of coffee, but this time I wanted the pure chocolate flavor. If your chocolate sauce turns to chocolate sugar, you can always re-warm it with a bit of water and it becomes a sauce again no problem. We begin with the least expensive, which involved a bit of cooking (not much though). 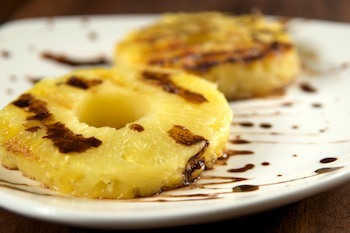 Cook 2 cups of balsamic vinegar down to make 1 cup refined syrupy balsamic vinegar. Add 1 cup refined balsamic vinegar to 1 cup chocolate syrup. When both the vinegar and chocolate syrup have cooled down, begin to mix the two. I was able to match the flavor with the “expensive brand” when I mixed the 2 together, meaning 1 cup rendered vinegar to 1 cup chocolate syrup. Mix well and pour into individual, sterilized bottles. This gave 2 cups of chocolate vinegar, I was able to give 3-4 generous gifts of chocolate vinegar from this. This is more of a chocolate sauce, with a kick of sweet vinegar and has a “creamy not- see-through” consistency of chocolate syrup and tastes super!!! Now, if you really want it to be a “clear” syrup, try the next recipe. We would suggest that you buy a chocolate flavoring (found at fine coffee shops, selling good coffee and flavors to add to good coffees). And, buy a really good (expensive) balsamic vinegar. You can tell by tipping the bottle to the side, if the vinegar is slow to move a long the inside of the bottle, it is most likely to be syrupy and a bit finer and sweeter than the cheaper brands. 2-3 tablespoons fine chocolate syrup. Begin my mixing 2-3 tablespoons of chocolate syrup to 1 cup of fine balsamic vinegar. Taste the mixture, if you wish more chocolate flavor, add a bit more. The flavor is up to you. We loved it with grilled pineapple and in fact it would be great with any grilled fruit, like plums, peaches warmed bananas etc. 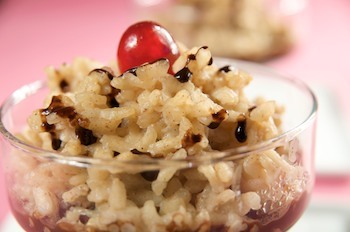 It is also lovely on cinnamon flavored rice pudding. You can also make little rice patties or balls with left over rice, roll them in some bread crumbs, fry them, and with a generous amount of chocolate vinegar they become very special. Another suggestion is the Strawberry Salad With Chocolate Balsamic Dressing from recipezaar. The possibilities are endless, and fun to think up. Just a short note, we also enjoy giving flavored vinegars and flavored mustards as gifts for the holidays. They are quick and easy to make and give your friend the opportunity to have special sauces and dressings throughout the year. If you would like more, please comment, and will will add recipes for cassis mustard, cinnamon mustard, strawberry, raspberry or blueberry vinegars and more. Posted by Chris Walker on December 4, 2008 in Chocolate, Condiments.